3 drawings on paper (1 sheet) : ink ; bottom image 4.625 x 6 in., on sheet 9.5 x 6 in. Ink sketches of preparation of news for broadcast and men listening to news. Top sketch of a man wearing eyeglasses, K. Kawasaki, sitting at a table under a single light hunting for news items. Middle sketch of a man, G. Arita, lying under covers with eyes closed at 9:42 PM. Bottom sketch of six men listening to news read aloud in barracks. 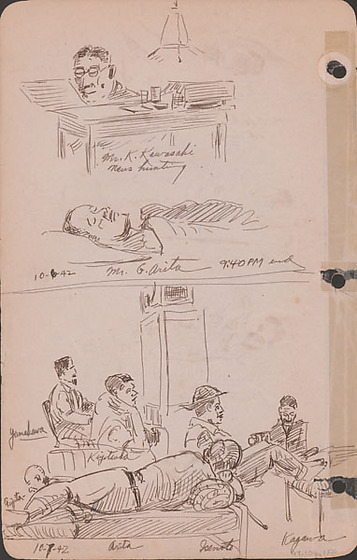 One man, Arita, lies on his side with back to viewer in foreground ; three men, Yamekawa, Kiyotsuka and Isemoto, sit facing right next to heater ; one man, Kagawa, sits looking down on right ; a bald man in profile faces left on the left side. Drawing 97.106.1FE on recto of same sheet. Written in black ink on top image, bottom: Mr. K. Kawasaki / news hunting. Written in black ink on middle image, bottom: Mr. G. Arita 9:40 PM end. Written in black ink on bottom image (left to right): Fujita, Yamekawa, Kiyotsuka, Arita, Isemoto, Kagawa. Written in black ink on bottom image, bottom left: 10-7-42.